Opposition from foreign and domestic forces arrayed against LGBTQ rights failed to disrupt an annual march in Kiev, bolstering Ukraine’s halting efforts to align with the West. 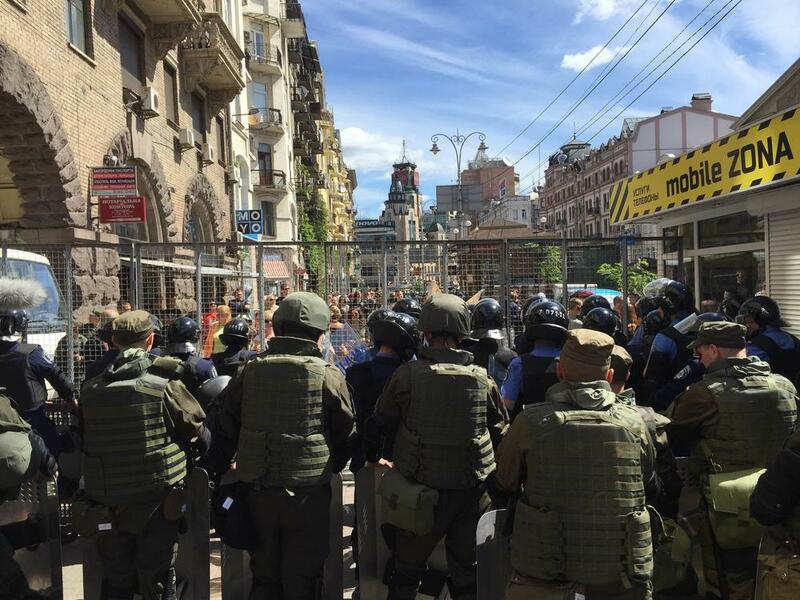 The June 12, 2016, march in Kiev passed peacefully, but the security arrangements that it entailed came as a reminder that from the United States to Ukraine, from Iraq to Bangladesh and Russia, LGBTQ people are a target. Islamic fundamentalists, Christian Orthodox activists or far-right nationalist groups and other radical movements are choosing homosexuality as a top enemy symbolizing what they see as a “decadent” West. This trend has put gay rights not only on the frontline in the battle for human rights; civic expression of the LGBTQ community’s existence has become engulfed in geopolitics. In Ukraine, this has deeply entangled LGBTQ lives in a complex war with Russia. Powerful, Kremlin-funded propaganda is tapping into the existing homophobia in Ukraine’s socially conservative society to cast sexual minorities as a Western creation. Russian-backed rebels in eastern Ukraine often cite homosexuality (or “homofascism”) as one of the primary reasons they took up arms against the government in Kiev. Ultra-nationalist, far-right groups in western Ukraine have also embraced violent homophobia, causing a spike in vicious attacks on gay men. Since the 2013 Maidan protests that ousted former Ukrainian President Viktor Yanukovych, the issue of LGBTQ rights has become a litmus test for creating a more tolerant and democratic society. 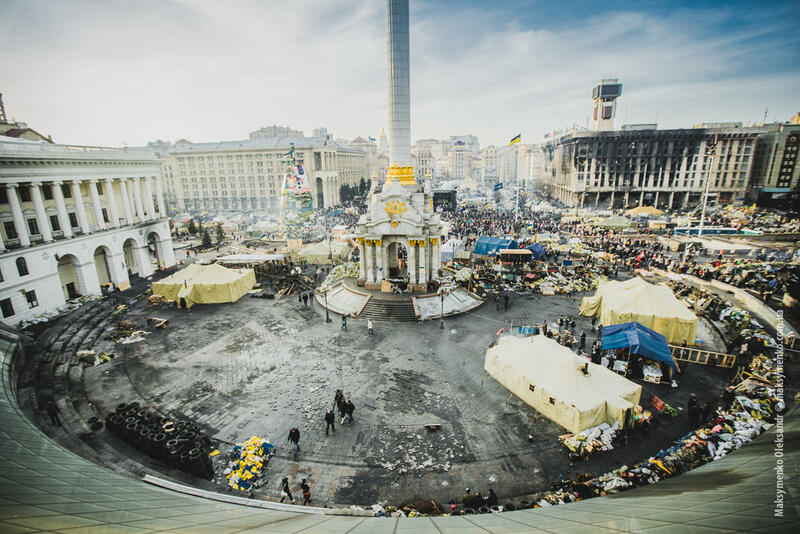 Post-Maidan Ukraine committed to freedoms including the freedom to assemble, but marches since the protests have either been banned or marred with violence. The Sunday Equality March in Kiev was a test of whether Ukraine, supported by the European Union and the United States, can trump the tradition of intolerance that the Kremlin, and far-right groups, have been trying to promote. 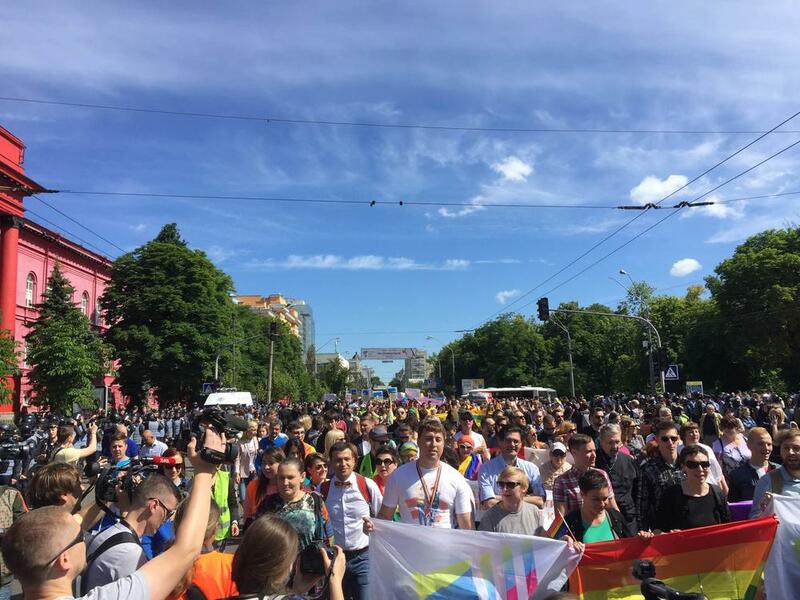 The march ended as the most peaceful LGBTQ event held in the post-Soviet space (with the exception of Baltic states that committed to Westernizing early and joined the EU in 2004). Nearly two thousand people took part according to organizers, including five members of the Ukrainian parliament, three members of the European parliament and four European ambassadors. Unlike in past years, Ukrainian police aggressively protected marchers at the 2016 Sunday Equality March in Kiev. Photo © Ian Bateson. But it took a massive effort to keep them safe. Six thousand police officers encircled a giant perimeter, cordoning off the far-right activists searching for holes in their defenses. After marchers walked the five hundred and fifty yards shouting “human rights above all else” they were put on buses and into empty metro cars to disperse them throughout the city and shield them from attacks. “We took an oath to protect every person and citizen of our country. We, of course, didn’t take that oath to protect people selectively and will ensure safety,” said Khatia Dekanoidze, chief of the Ukrainian national police force on Thursday before the march. In Ukraine, vocal police support to protect gay people signals a change from the past. “Last year at the planning meeting for the march with the police and Western diplomats one of the police looked at me and said ‘you want blood I can see it,’” said Zoryan Kis, an activist responsible for security at the march. The Sunday Equality March in Kiev was a test of whether Ukraine can trump intolerance imported by the Kremlin and promoted by Ukrainian far-right groups. Unlike in past years, Western government scrutiny, as well as training and equipping Ukraine’s new police helped communicate to local authorities that protecting LGBTQ rights is an important factor in judging the country’s European ambitions. Europeans and American embassies sent security experts to evaluate police preparations and monitor the march and special Envoy for the Human Rights of LGBTI Persons Randy Berry visited from Washington to meet with officials. Participants in the 2016 Sunday Equality March in Kiev. Photo © Ian Bateson. Establishment political support for the march was visible in Kiev. The city’s metro has been full of posters of prominent Ukrainians voicing their support. Even Kiev mayor Vitali Klitschko, who in 2014 derided Kyiv Pride as an unwanted carnival, officially supported it after a receiving an open letter from Jamala, the 2016 Eurovision song contest winner from Ukraine. “I feel like they finally gave me a voice,” said Ira, a 26-year-old lesbian who marched for the first time. But daily life for LGBTQ Ukrainians remains vulnerable to violence and discrimination. For many, the euphoria of having managed to organize their first peaceful march was overshadowed by the shocking news from Orlando, a reminder that governments cannot always protect their citizens and that even in the most LGBTQ-friendly countries homophobia can still flourish and kill.